The Russian federation, after the recent scandals regarding doping, had decided not let its own racewalkers attend the World Championships, in order to no further threaten the position of the National team. 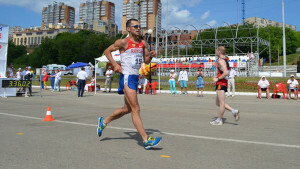 Once the teams were published, though, we were all surprised to find out that one athlete had actually been summoned, Alexander Yargunkin, who should have competed tonight in the 50km marathon because not trained by the disputable Viktor Chegin. Despite the intention of the Federation not to get any more bashed with doping accusations, a few days before leaving for China, Yargunkin has been tested positive to EPO and he has been consequentially stopped. The sanctions for the athlete have not been published yet, we can only wait.